Vitamin C – A water-soluble vitamin that may help reduce stress and fight infection. Necessary to form collagen; support skin, tendons, ligaments and blood vessels. Has strong antioxidant properties. Essential for wound healing and repair and maintenance of cartilage, bones and teeth. Vitamin D† – The major biologic function of vitamin D is to maintain normal blood levels of calcium and phosphorus. Vitamin D aids in the absorption of calcium, helping to form and maintain strong bones. Vitamin E – This fat-soluble vitamin is found in nuts, green, leafy vegetables, fortified cereals, and some fruits. May help skin, promote wound healing, and protection against free radical damage. Vitamin K† – Found in green leafy vegetables like spinach and broccoli. Necessary for the synthesis of proteins, healthy bones and blood health. Thiamin – Vitamin B1, a water-soluble vitamin that may help with conversion of carbohydrates and fat into energy. Essential for normal growth and development. Helps maintain heart, nervous and digestive systems. 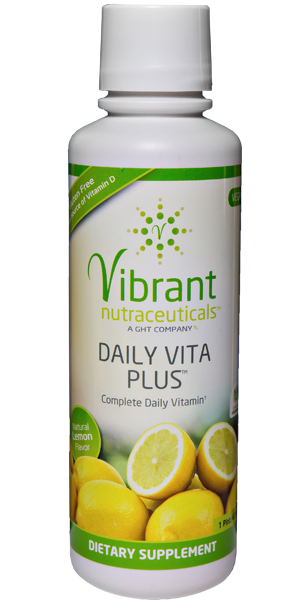 Riboflavin – Also known as Vitamin B2, this nutrient is one of the 8 water-soluble B vitamins. It is contained in food sources such as brewer’s yeast, almonds, organ meats, and whole grains. 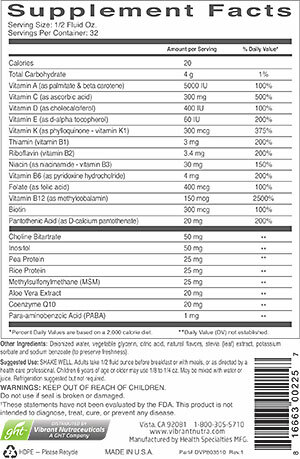 Niacin – Vitamin B3 is required for the metabolism of carbohydrates, fats, and many other substances. May be effective to maintain healthy cholesterol, protect the heart, improve digestion, prevent migraines and mild mood changes. Vitamin B-6 – This vitamin assists in breaking down, use, and reforming of protein building blocks. It is found in muscle and organ meats, fortified breakfast cereals and brussel sprouts. Folic Acid – Vitamin B9 is a water-soluble vitamin which occurs in some leafy green vegetables, dried beans and peas, fortified cereal products, among other foods. May assist proper brain function and DNA/RNA production. Important during periods of high growth, such as infancy, adolescence and pregnancy. Vitamin B-12 – A water-soluble B vitamin, Cobalamin is found primarily in meat, and dairy products. Works with folic acid in the synthesis of DNA and red blood cells. Helps maintain health of the myelian sheath surrounding each nerve. Biotin – A member of the B complex, although not a vitamin, Biotin is essential to the health of every cell membrane. Foods rich in biotin are egg yolks, milk, poultry, fish, broccoli, spinach, and cauliflower. Pantothenic Acid – Vitamin B5 is a water-soluble vitamin found throughout living cells in the form of Coenzyme A (CoA), a vital coenzyme in many chemical reactions. It may help with wound healing and cholesterol health. Choline Bitartrate – A water-soluble B vitamin that may enhance the body’s ability to manufacture proteoglycans, essential for healthy joints, as well as supporting synovial fluid inside the joints. Inositol – A member of the B complex family, although not a vitamin. Essential to the health of every cell. May assist nerve function, as well as play an important role in brain, bone marrow, eyesight and intestinal health, among many other things. Methyl Sulfonyl Methane (MSM) – Found in certain green plants, certain species of algae, fruits, vegetables, grains, to name a few. Metabolizes as sulfur when joined with amino acids, zinc, copper, silicon and Vitamin C. MSM may help maintain healthy joint function. Para-aminobenzoic Acid (PABA) – A non-protein amino acid found widely in nature, this nutrient may be important to the synthesis of folic acid, among other things. Co-Enzyme Q-10 – A naturally-occurring nutrient in many foods. An antioxidant critical to energy production in every cell. May help heart function, circulatory, and immune function. Aloe Vera Extract – An aloe vera plant extract which may aid digestion, blood and lymphatic circulation, wound healing, as well as kidney, liver and gall bladder function. Helps keep the skin supple and healthy.